Here's some lemon balm that's naturalized itself. It was a nice little green surprise as I was walking around with my camera today. 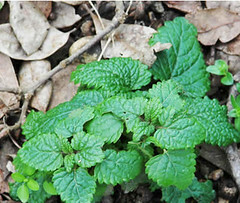 Being a member of the mint family, lemon balm will spread like crazy if you don't keep it contained. But, since the garden here has been neglected for years, there are only a few isolated clumps left. I used to have a mint bed in the garden, and it all spread, as expected. But after so many years, I find that only the lemon balm remains. If you've never seen/smelt it, it has a very lemony scent, with a hint of grassiness. It's nice in iced tea, as you might add a sprig of mint. Or you can make a tea from a good size bundle of the leaves. Mix some into butter for a lemony compound butter to use in tea sandwiches for a little different flavor. Try chopping a few leaves in a salad, or use a chiffonade in the water when poaching fish or, even, chicken. It's a pretty versatile herb, since there are so many places where a little lemon is a good addition. You can even use it in potpourris or other room scenting applications. Here's a simple recipe using lemon balm as an edible garnish. And I even have a pic! Sorry it's so out of season. This is so simple and so delicious. 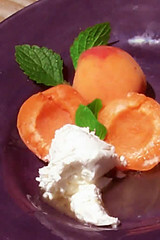 Just halve an apricot for each serving, put a scoop of chevre beside it, and drizzle a little honey over it. Garnish with either lemon balm or a flavored mint, and that's it! It’s both colorful and exotic with the very different tastes and texture of the ingredients. For this week's roundup of herb blogging posts, visit Kalyn's Kitchen. Lots of nice pics, good info and yummy recipes. I've heard about this plant, but haven't seen it. I love the idea of a plant that smells like lemons! It's not a true lemon, but pretty lemony all the same. Also, it's a different plant from lemon mint, which is mint with a lemony twist. Celestial Seasonings used to do a Lemon Zinger (?) tea with lemon balm and lemon grass and a couple other things, that I used to make iced tea when I lived in Baltimore. It was really good, but they discontinued it. Wait, it wasn't Lemon Zinger, it was Lemon Iced Delight. It had a delicate flavor, much more appealing and pleasant to me than the Zinger one. Hello from the south bay. Lemon balm sounds like just the kind of plant I need for my yard - one that's pretty hardy and tasty too. Sadly my lemon thyme was eaten by gophers, so I'm looking for some more lemony flavors. Thanks! I use lemon balm in my herbal (tea) infusions - fresh, when available, or dried otherwise. It also goes very well with various fruit salads - pineapple, orange, pears and strawberries. Looks gorgeous on your picture! Heidi, we have a big problem with gophers, too, so the herbs that have naturalized, like lemon balm and Sicilian oregano, see to be gopher proof. Good luck. Keep in mind that this stuff really spreads. Pille, yes it's very good with all kinds of fresh tasting things. It's a handy plant to have all round. That fruit salad sounds wonderful. Coincidentally, we just bought a lemon scented conifer for our garden. A work colleague of Mark's had donated us two gorgeous wrought iron garden chairs and they needed something between them to set them off. The conifer really does give off a lemon scent, (I was amazed!) Do you think it's the same family, or can they cross breed plants like that? I'm also wondering if it will deter insects in the summer. Hi, Saskia! That sounds delightful, especially when you get a few hot days. As for the insects, it's a possibility. After all, it's citronella that they hate. Do you have any idea what the tree is called? We had one of our big firs die, and it would be nice to replace it with something a little different. It's a lemon-scented Cypressus Wilma. We got a small one for the patio, but they can grow to 10 metres. Oh yum that apricot chevre and honey with lemon balm looks to die for. I was looking at your profile and it says your fav movie was bringing up baby I had to just say that it is one of my absolutly fav movies as well! I got all excited.